It’s been about a dozen years since I first realized that there is a world-wide HTML epidemic. Although I speak about the importance of semantic markup and tweet about it often, I wish I’d written specifically about it before. Thankfully others have such as Bruce Lawson, Manuel Matuzovic, and Laura Kalbag. Web developers overwhelmingly fail when it comes to implementing semantic HTML, whether they actually know how to or not. There are many negative ramifications of this in the areas of device interoperability, reader modes, converting to PDF and EPUB formats, SEO, graceful degradation, code consistency/maintenance, and demonstrating professionalism. But particularly web accessibility. Recently, WebAIM published a report analyzing the accessibility of the top one million website homepages in the world, called The WebAIM Million. This is striking empirical data on how poor accessibility is and how poor the quality of HTML is on the Web. For example, here are some figures from the study. There was an average of 59.6 [accessibility] errors per page. 97.8% of home pages had detectable WCAG 2 failures. 5 of the top 6 issues were due to solely to improper HTML (missing alternative text for images, empty links, missing form input labels, missing document language, empty buttons). 2,099,665 layout tables were detected compared to only 113,737 data tables (note that tables are for data, not layout). On average, home pages had 36 distinct instances of text with insufficient contrast. This is obviously bad. And, it’s important to point out that the study was done using an automated tool, which is capable of detecting only a portion of actual accessibility issues/errors. I estimate that the amount of issues would at least double or even triple if full audits were done. Also, as a result of web developers’ poor HTML implementation, accessibility consultants are increasingly required to teach HTML to web developers rather than address “actual” accessibility issues. This is obviously a huge problem that must be addressed. What can we do to help resolve this HTML epidemic? Digital accessibility must be considered when hiring and training employees. Accessibility must be considered when creating a web-based product. Accessibility must be a part of ongoing training for web professionals. Accessibility needs to be taught in education. An organization called Teach Access (@teachaccess) is helping in some of these areas. Teach Access is a group of tech companies (including Apple, Google, LinkedIn, Adobe, and Microsoft) which is preparing designers, engineers and researchers to think and build inclusively . They have several initiatives including Faculty Grants and a web accessibility tutorial. And another way to fight the good fight for HTML semantics and accessibility is to become a member of Teach Access. 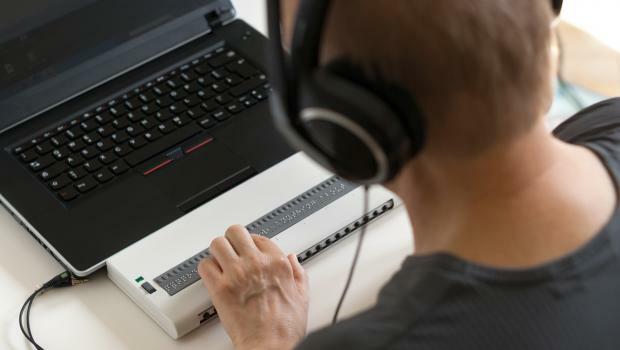 Teach Access is in partnership with PEAT (Partnership on Employment and Accessible Technology) which is a program funded by the Office of Disability Employment Policy, U.S. Department of Labor. If you’re involved in education, please reach out to teachers and professors about Teach Access and about digital accessibility in general. HTML and web design are often part of computer science, software engineering, and mass media, advertising, and news programs. You can also offer to give a guest lecture. 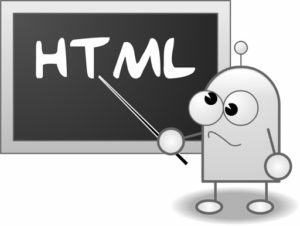 If you have further ideas on how to improve the use of HTML semantics (and web accessibility), please leave in a comment on this post. “The web industry has collectively exercised its power to state that disabled people do not belong here.” Perpetuating Harm – https://t.co/Gb0bsIvRJb by @suchwinston. If the results of our Million report are discouraging to you, read this – then go do something about it! The WebAIM Million – an in-depth accessibility analysis of 1,000,000 web site home pages. Full report at https://t.co/iP1P0zyA55 Blog post/summary at https://t.co/OYh4mfxu1B This is an incredible amount of data that show we still have a lot of work to do! Jared Smith (@jared_w_smith) of WebAIM recently launched a clever web page on why carousels are not good practice called Should I Use A Carousel? (which totally went viral on its launch day!) There is a slide deck Keyboard and Interaction Accessibility Techniques (on Slideshare) for which this website was made. 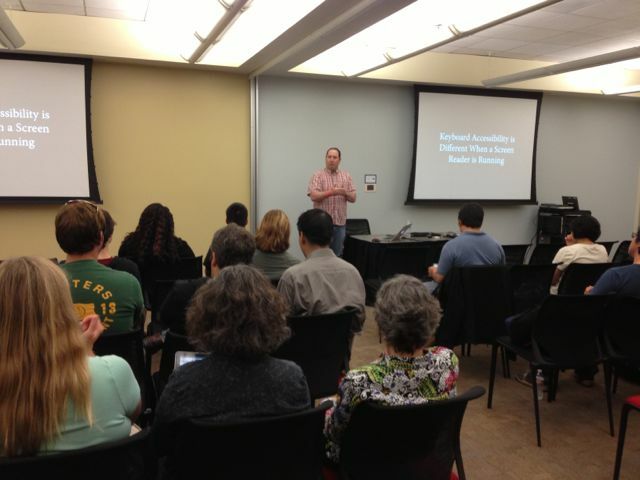 I was fortunate enough to see Jared present this at Open Web Camp 5 July 13 at PayPal. Let the user start the carousel animation. Give the user the ability to pause the carousel. Ensure the controls have textual labels. Ensure the control of the currently displayed panel is indicated visually and programmatically. Ensure the controls have ample hit areas (for mobile, fine motor disability). Each carousel content container has a role of tabpanel. Each control, typical designed as dots, has a role of tab. The container of the controls/tabs has a role of tablist. Add aria-labelledby to the tabpanels which point to the id of the associated control/tab. To each control/tab, add aria-controls (which points to the id of the associated tabpanel) and aria-selected (boolean) attributes. Remove the CAPTCHA Exception – should prohibit all CAPTCHA at Level AA. Media Guidelines – a few suggestions here plus a recommendation for restructuring. Contrast at Level A -minimal contrast requirement needed for Level A. Decrease the 200% Text Resizing Requirement -biggest burden of Level AA. Clarify Images of Text -this is subjective. Specify Mechanisms to Bypass Blocks – add techniques such as skip-to, headings, landmark roles, and others. “Can Be Programmatically Determined” -a confusing aspect of page conformance. Require Keyboard Focus Indicators at Level A – “There is no reason why this should not be a Level A requirement.” Totally! Remove Parsing Requirement – no direct benefit and difficult to test for accessibility; possibly move code validation requirement to Level AAA.